Read what fellow blogger, travel journalist, and English teacher living in Barcelona had to say about her recent “Total French Immersion” experience with me in Béziers a few weeks ago. Immersion classes are so much fun, both for students and teacher! So I decided it was time to try and learn French. Having been presented with a Master’s research trip and project based on alternative tourism in France I knew I would be frustrated if I didn’t understand what was going on, if I wasn’t able to communicate and make myself understood. I knew I had to try and learn, and quickly. But as always, learning a language is a daunting process. We are faced with hours of grammatical study, with the frustration of listening exercises, and with the shyness behind ‘getting it wrong’, ‘making a fool out of ourselves’. We may have found an apartment in Béziers! I’ll begin the official 10 day countdown tomorrow, but for today, it’s worth noting that I’m leaving for France in 11 days! I’ll be there for about a week before heading down to Montpellier to start my summer job with Oxbridge Académie de France. François and the kids will follow, but not for a few weeks. They’re staying here to tie up some loose ends and to deal with the shipment of our container. Originally I thought the container would take months to arrive in Béziers, but now they’re convincing me that it will be there in 30-35 days (!) and they need an address for delivery. We were planning to take the month of August to look for an apartment, but now it looks as though we’d better have one by August 1 when our container arrives. This may seem a bit stressful, but it’s not! It’s really very exciting, and this is when I realize (once again) how very fortunate we are to have family who are happy to help. My sister-in-law in Béziers has found an apartment for us, and it seems like it will be the perfect place. What’s really nice about it is that the owner’s are friends of friends, and they’re willing to reduce the rent by €50 and not charge us a deposit. That’s great news, and the apartment is in a nice and safe part of town. It’s right across the street from the university and médiathèque, and it’s only a 12 minute walk from the school where our kids will go. I asked my sister-in-law to give me the not so good news about the condition of the apartment first. Basically, there is a lot of painting to be done, and some of the windows don’t close very easily. But now for the good news! It’s HUGE! The apartment measures 167 square meters, or 1800 square feet. There are four large bedrooms, an office, living room, dining room, kitchen, three small balconies on the back side and one large one all across the front. There’s only one “toilette”, and it’s separate from the bathroom, and that’s all fine with us. There’s a nice size kitchen, but it doesn’t come equipped with a stove or refrigerator or any of that good stuff. From what I hear, that’s very typical in French apartments, and it’s what we were expecting. There are fireplaces in all of the rooms, and though I’m sure none of them are functioning, they’re still pretty. There are 13 foot ceilings. Yep, that’s right. 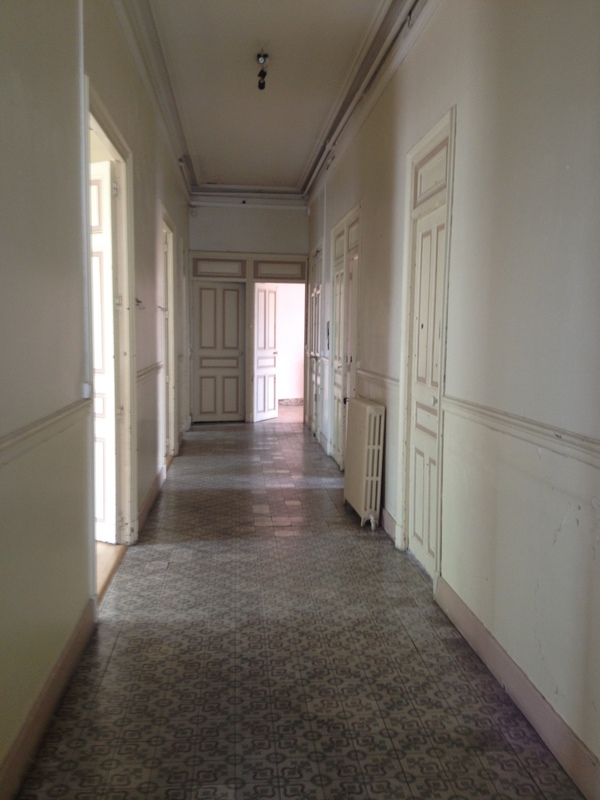 When you walk into the apartment, you enter a large (wide) and very long hallway, and you enter all of the rooms from either the left or the right of this hallway. It’s big enough to furnish and serve as a sort of foyer. The “toilette” is at one end, and the bathroom at the other. 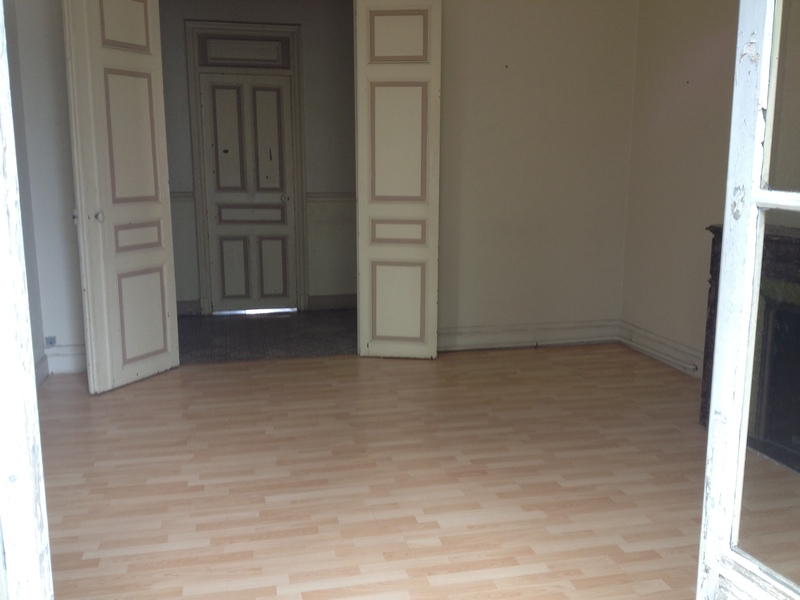 To give an idea of what the place looks like, I’ll show a few pictures. It’s obvious in the pictures that the place needs some sprucing up, but at the same time I can see it’s charm. Here’s a picture of one of the bedrooms. This one is on the front, and the windows open up to a balcony and view of the university and library below. This is the big hallway that I mentioned earlier. This is the living room, the picture’s taken from the balcony. It’s all very exciting, especially now that we can visualize our new home. Having spent a lot of time in Béziers, and with the help of Google Earth, it’s easy to imagine exactly where the apartment is located. Last night I decided to take the train from St. Louis to Chicago rather than drive or fly. The last time I took the train in the US was again from St. Louis to Chicago to apply for a long-stay visa at the French Consulate in Chicago, but that was 15 years ago. Things have changed, and for the better! The Amtrak trains still aren’t fast, but this one was clean and believe it or not the passengers were well-behaved! I made it to Chicago at 11:00 and twelve hours later I was at the consulate turning in all of my documents to obtain a long-stay visa that will permit me to live and work legally in France for a year while taking the steps to gain French nationality. It went very well, and I’ll have my passport back in time to travel to France on June 17. I’m relieved to know that I can check that off of my list. They don’t call Chicago the Windy City for nothing. It’s pretty windy and cold out there, and I forgot to bring a jacket. I guess I thought my thoughts were focused on the Mediterranean. This is a picture of me, my sister, and my mom. Don’t we all look alike? Let’s take a leap back in time about 14 years to 1998, and that was the first time that I lived in Béziers. I had just gotten married (three times, all to the same man), and we were living in France, waiting for my husband’s Green Card approval. All of that is a story for another time. What I’d like to write about is the time Mom came over to visit us. It was October, and that’s my birthday month. Mom was still working back then, but had taken a few weeks of vacation. She’d already been to France once, at the time of our wedding, and felt adventurous enough to make the long trip from Louisiana on her own. Getting to Paris was no problem. She just hopped on a direct flight from New Orleans, and ten hours or so later, she was at Charles de Gaulle airport in Paris. My father-in-law very graciously met her at the airport and drove her to the Gare de Lyon. She was to take the TGV directly to Montpellier, then make a connection to Béziers. This was our big mistake. We should have just had her fly down to Béziers, because she doesn’t speak any French, and she’d certainly not had any experience with train travel in Europe. The ride on the TGV was perfect, and she made it down to Montpellier with absolutely no problems. Before getting on the train in Paris, my father-in-law had spoken with a fellow traveler (who spoke English), and had asked him to direct my mom to the right platform to make her connection to Béziers. The kind traveler did just that, or so mom thought. Trusting soul that she is, she didn’t think about double-checking to make sure she was in the right place. Long story short, she hopped on a non-stop TGV that took her directly back to Paris. I don’t think she realized it right away, with the jet-lag she was certainly experiencing, but before too long she understood that she should have been in Béziers by then! But it was a non-stop TGV. When the conductor came around for tickets, and she didn’t have one, he was kind and patient enough to finally understand what had happened. They didn’t charge her anything, but there was no option except to sit back and enjoy the ride to Paris. Now by this time, she’d been traveling for quite some time, and was really getting tired. This was in 1998, and it wasn’t like today when everyone has cell phones. She didn’t have one, so she couldn’t call us. When we got to the train station in Béziers, with my husband and son who was then only 7, we fully expected to find “Meme” and bring her home with us for a nice two week visit. But there was no Meme getting off of the train. I was desperately worried. Had she fallen asleep on the train? Where was it heading to next? We only had two or three minutes to look around on the train for her before it left for the next destination. No Meme. Not knowing what in the world to do, we waited for the next train from Montpellier to arrive. Still no Meme. I could just imagine her having fallen asleep on the train, only to wake up somewhere in Spain not knowing where she was. I was worried sick. We went back to our apartment, called my brother and sister-in-law (who also live in Béziers), and told them what had happened. We waited by the phone, not daring to leave the apartment for fear of missing her call. About two or three hours passed, then the phone rang. It was my brother-in-law, Jean-Marie. He had only one declaration to make, and that was, “J’ai trouvé Meme! !” (I’ve found Meme). “What?? Where is she? ?” Jean-Marie explained that he’d received a phone call at home from my mom. She’d arrived in Paris, and had called the only number she had with her, which was his. You know how it is, hind sight is 20/20 when it comes to traveling, especially to a foreign country where you don’t speak the language. She’d explained to him what had happened, and thankfully his knowledge of English was MUCH better than what he’d ever led me to think! Not wanting to disturb my parents-in-law in Paris (though she should have, but that’s not her style), she’d purchased another ticket to Béziers that very night. How many hours had she been traveling?? I’m not sure, but we’re probably beginning to move beyond the 24 hour mark. This particular train was not a TGV, it was too late for that. It was a very slow-moving night train. Meme was scheduled to arrive in Béziers around 8:00 in the morning. Poor thing, and as a born and bred southerner, there’s only one phrase that fits. “Bless her little heart”. I sure didn’t sleep well that night, and keep in mind that I hadn’t yet spoken to my mom. At 8:00 in the morning, we were at the train station waiting for her, still with a doubt in my mind whether she’d step off of the train or not. Lo and behold, an understandably exhausted and somewhat frustrated Meme emerged (though she’s a Southern Lady, and you wouldn’t have known anything was wrong if you’d seen her). We brought Meme home, had a big ole pot of American-style coffee brewed and ready, and heard her firsthand account of her adventure. Now how many grandmas have that kind of story to tell? I can tell you one thing, now that she knows we are moving back to France, she hasn’t sworn off traveling over there to see us. However, she will not be taking the train. 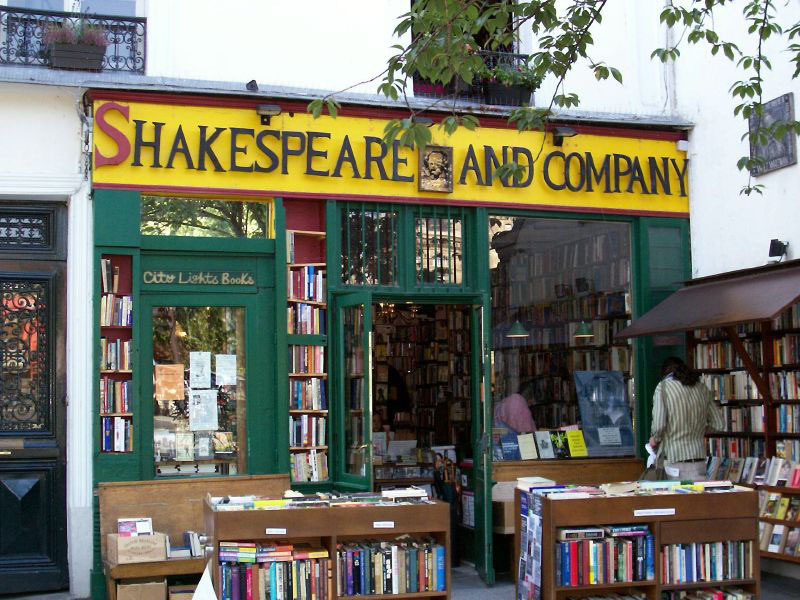 Just before leaving for my very first trip to Paris back in 1992, my French teacher told me to go and see the legendary bookstore “Shakespeare and Company”. That’s what I did, and since then I’ve had a bit of an obsession with the history of this legendary English bookstore and all of those who helped to give it a name in history. Fast forward about twenty years, and my obsession is mainly focused on Ernest Hemingway and his life in Paris in the twenties. Of course, sometimes I deviate and become fascinated with the likes of F. Scott Fitzgerald, his wife Zelda, and Gertrude Stein just to name a few. Like many others, my passion was renewed with the release of Woody Allen’s Midnight in Paris. I first saw this movie in June, 2011, while in Paris. I heard that the movie was released in Paris before being released in the United States, but I’m not sure if that’s true. Anyway, I was traveling with a group of my students, and had dropped them off for some exploratory time at the Louvre. It was pouring down rain, and I didn’t have an umbrella. I knew it would be pointless to rush, so I strolled at a leisurely pace through the Tuilerie Gardens, beyond the Place de la Concorde, on up the Champs-Élysées, and right into a cinéma where I spent the next hour and a half or so falling in love with the Paris that had just seen me drenched to the bone. What a treat it was to walk out of the theater only to find that it was still raining. When I’d at last finalized my itinerary, I knew it would be a long walk that would take all day. What an adventure! I put on my not so comfortable walking shoes (had to look good, it’s Paris, after all), grabbed a book and my journal, and I started out from the 15th arrondissement where our studio apartment is located. 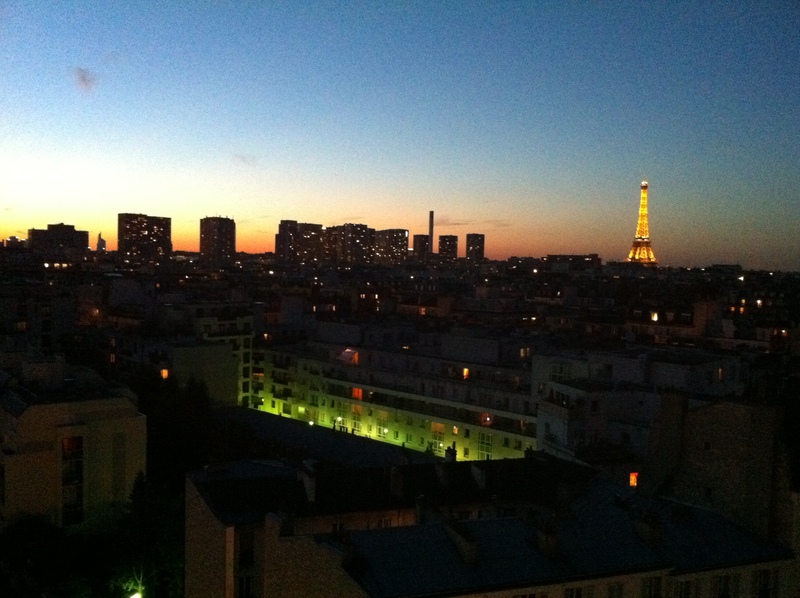 I made my way, by foot, over to the Montparnasse district. I basically did the walk described on the SlowTravelFrance blog, except I did it in reverse because it was more practical for me. I started down the Boulevard du Montparnasse, walked past La Coupole, La Closerie des Lilas… Originally I had intended to stop at La Closerie des Lilas for an afternoon refreshment. It was one of Hemingway’s favorite writing (and undoubtedly drinking) spots. Also, I’m of the generation of Robert & Mireille in French in Action, and many of their rendez-vous took place in this café. My plans changed when I had a look at the menu prices. Thankfully they’re listed outside. Instead, I planted myself on the bench out front, drank my bottle of water, smoked a cigarette from the pack that cost me almost $10 USD, and chewed on a piece of Hollywood Chewing Gum that I’d bought at the Tabac. Once I’d rested up a bit, I continued on to the Rue de Fleurus, and that’s where Gertrude Stein’s apartment can be found at #27. I was mainly reminded of scenes from Midnight in Paris when I got there. I was the only person on the street who was stopping to have a look, and I felt a bit strange because even though it was Gertrude Stein’s apartment, it’s somebody else’s apartment now! I was gazing up at one of the windows, and when I caught sight of someone gazing back at me, I embarrassedly scurried off toward the Jardin du Luxembourg. By this time, it was mid-afternoon, and it was hot in Paris on that day. I was ready for a cold drink, so before entering the Jardin du Luxembourg, I stopped in a shoddy little café for a beer. I’m usually not a beer drinker, but it sure did taste good as I sat on the terrace of this dirty-ish café and wrote in my journal. I don’t remember the name of the place where I had my beer, but even though it was dirty and they only had a one Turkish unisex bathroom, I’d recommend it because I made a great memory for myself on my Hemingway Day all by myself in Paris. Next I went into the Jardin du Luxembourg. I decided to sit and read for a while. I knew that Hemingway had spent a goodly amount of time here, and some of that time was caught catching pigeons to eat so that he, Hadley, and Bumby wouldn’t starve to death. I wonder if the pigeons of the twenties were the mutant pigeons of today? It was a gorgeous day, so I found a shady spot on the grass and laid down with my book. I was quickly distracted by an American couple who were so in love! What I appreciated so much about them, and why I watched them unabashedly for about fifteen straight minutes, was because they were in love in Paris! And they weren’t attractive. They were not very well-dressed, they were slightly over weight, but they were in full PDA mode, and it was beautiful. I don’t think they would have behaved like that in the US. After the PDA and about a chapter of my book, I was ready to carry on. I headed up to the Boulevard St-Germain-des-Prés, had a look at the famous café les Deux Magots, continued on rue St-Sulpice, and finally down the rue de Vaugirard. I made my way along the Quai des Grands Augustins and perused the bouquinistes of which Hemingway was so fond. On to Shakespeare and Company where Sylvia Beach once loaned books, and even fed and housed Hemingway and his contemporaries from time to time. Sylvia Beach had to close shop after WWII, but it has since been reopened by one George Whitman, who carries on the tradition of caring for artists and writers alike. I only had two more stops to make on my walking tour. I wanted to find Ernest and Hadley’s first apartment at 74 rue du Cardinal-Lemoine, and I wanted to also see the room Hemingway rented in a hotel nearby at 39 rue Descartes. I couldn’t find the former, even though I must have walked up and down the narrow street a dozen times. I wonder if it’s just not marked with the number 74?? 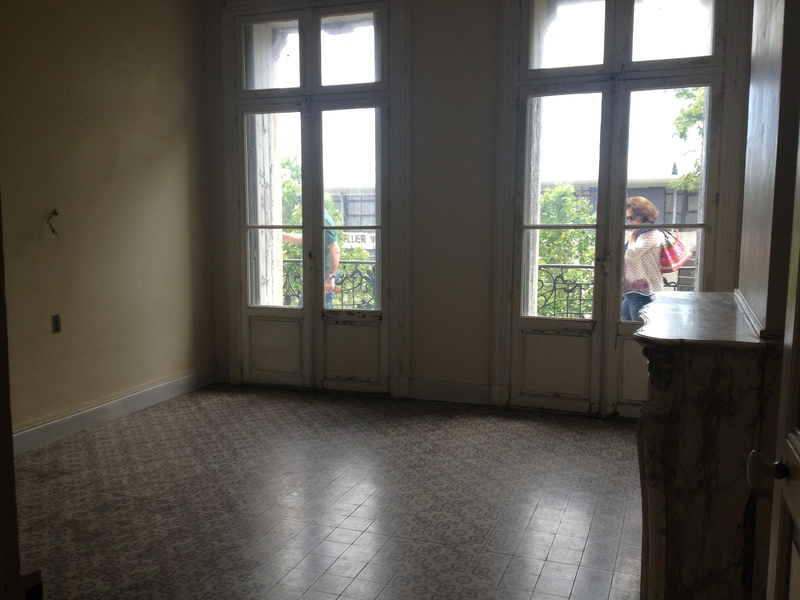 However, I did find 39 rue Descartes, where Hemingway rented a room and tried to write. There is a small plaque on the wall that says (in English) that “Ernest Hemingway lived in this building from 1921-1925”, but it’s not true. That’s just where he went to work, or more likely to get away from family life with Hadley and Bumby. There’s a larger plaque on the wall that says (in French) that “Dans cette maison est mort le 8 janvier 1896 le poète Paul VERLAINE…” I wonder if Hemingway knew that when he took the room? By this time, it was probably getting close to 7 pm. I was tired (in a good way) from walking all day, and was starting to get hungry. It would have been easy to have a seat in one of the many Latin Quarter cafés for a little something to eat and to people watch, but I opted to take the Métro back to the 15th. When I got back to my neighborhood, I stopped chez l’Arabe (the neighborhood convenient store) and picked up some pasta, Barilla sauce aux olives, shredded emmenthal cheese, and a bottle of wine. I went back to our 11th floor studio apartment, cooked my poet’s repast, and opened the window to the view you see in the picture below. That was a day well spent. I’m so ready for spring to get here. Yesterday it was snowing up a storm, so we may have to wait a little while before seeing some nice weather. With the arrival of spring, the countdown to summer gets shorter and shorter every day. I figured out that we only have about seven more full weeks of teaching left (not including holidays), and then we will quickly be getting our furniture ready to ship on the container. It’s supposed to take 3-8 weeks to arrive in Béziers. My last day of work is in May, but François has to work until June 18. I’ve been spending some time (when I can find it) looking at apartment websites, just to see what’s out there, how much the rent will be, what the conditions are, etc. Of course, that’s a bit frustrating because as soon as I find something I love, I remember that it’s a little to early to start signing papers! I really hope we will be able to find a spacious apartment in a nice area of town so that we can walk everywhere (bringing kids to school, grocery shopping, going to restaurants and cafés!). On the other hand, there are some really cute “villas” for rent, and they’re more spacious, newer, have private gardens…. But they’re not right in town. It sure would be nice to have an extra bedroom to have for when people come to visit. I’ve got a feeling we’ll have quite a few visitors now that we’re going to live in France!! It really is hard to stay focused on the tasks at hand though. I’m so excited and ready for this adventure. My husband is a bit antsy and nervous about the whole affair (especially about finding jobs), but I just know that it’s going to be great. I have a very good feeling about it all. House has sold, and we’re really moving to France. After seven months of pursuing our dream of selling our house then moving to France, today it has officially happened. We closed on the sale of our house in St. Louis! Neither of us was quite ready to believe it until all of the closing papers had been signed. Until the last minute, we were living in doubt. Since putting our house on the market back in March, 2012, we have had six different contracts fall through for one reason or another. We really wanted to move to France this past summer, and it was a harsh reality to accept that it just wasn’t going to happen, not exactly the way we wanted it to. Looking at the big picture, we can both see that leaving next summer will be much more practical on many levels. We will be staying on in St. Louis until mid-June 2013 due to the nature of our jobs (we are teachers), and also to avoid interrupting the school year for our children (ages 5 and 8). This wait will also give us the opportunity to save more money, as we will now be paying to rent an apartment rather than paying a home mortgage! In addition, we won’t feel rushed and unsure about everything as we did last spring. Not knowing if we were going to move put us in a position where we couldn’t really talk to many people about our grand adventure. This time, we will be able to share our dream coming true with friends, family, colleagues. There will not have to be any secrecy about it now. In the spring, when we were hoping to sell our house quickly, we still knew that there was a huge amount of uncertainty involving our move. We couldn’t inform our employers of our move, just in case things didn’t work out. We knew that if the house didn’t sell, we would need to have our jobs in the fall. That was good thinking on our part, even if it was very difficult to stay quiet about it all. Our first step now will be to find an apartment to live in for the next seven months, and it shouldn’t be hard to find one right in our neighborhood. The next step will be to eventually inform our employers that we will not be returning in the fall. I think that can wait a few months, still giving them time to find our replacements. Beyond that, there’s everything we need to get done logistically speaking for the big plunge: French nationality for me, and American nationality for my husband being the two main tasks at hand. As the months go on, we will plan out (as best we know how) our first year of living in the south of France. We need to find jobs, some reliable source of income to support our family. I feel very optimistic about this as we are two very marketable professionals with many talents, and we have some pretty good ideas already. My husband is a little less optimistic, but I think that’s just a result of (1) being a husband and father, and (2) being French! It does help to know that we are moving to a very familiar place where we have family, and we have also already spent a year living there (14 years ago). We have also spent the last 14 years spending the whole summer over there, so we feel comfortable. The kids and I already speak fluent French, which I’ve read all over the Internet as being one of the main obstacles of other American families who have the same dream of living in France. Here in the US, I’d say we already live as much of a “French lifestyle” as possible. It’s just the way we are. The way we live daily and the way we raise our children corresponds much more to a French norm than to the American way. Over the next seven months, I’ll do my best to record the steps we will take to get prepared. Hopefully this blog will serve to help others in the same boat (we can’t be the only ones doing this, right?). So now, let the fun begin! Thanks for reading, and I’d love any comments or questions that my readers may have. Let the French adventure begin! It’s kind of hard to believe that this is really going to happen for us. All of last year we were getting our house on the market, thinking all the while that we would be moving to France during the summer (after the successful sale of our home, of course!). By now we would have been settled down in the South of France, children would be learning lessons in a French school. Things sure don’t work out the way we sometimes imagine, do they? After the heartache of six failed contracts on our home, we now have a rather official looking “sold” sign in the front yard. The closing won’t be until next week on the 19th, but at this point there’s really no turning back for either parties. This is going to happen, and we need to find an apartment to live in for six months. We have negotiated staying in the house until the end of November, giving us time to pack and find a place to live. Everything now seems so official, and we both hope that we’re making the right decision. It’s going to be very hard to leave the house where our children have grown and continue to grow up. We have many, many memories after ten years in our little nest. The truth is, we really love our house, our home. I hope I won’t be too emotional on moving day. After ten months of really being proactive about moving to France, now it seems rather surreal to me. 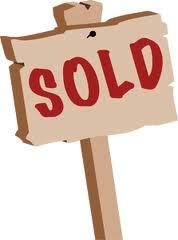 In many ways I consider us fortunate to not have sold our house in a rush during the summer. Selling it now will give us the proper opportunity to enjoy our last 6-7 months here and to live through the different emotional stages of such a transition. It will also give us a chance to save some money, and I’m sure we will be very glad we did! I haven’t written on this blog since the month of May. 4 months ago. I think I just spent so much of last year getting ready for the move to France that wasn’t. We spent almost a whole year getting the house ready for the market, packing, taking care of administrative details, and just gearing up emotionally. We’d decided 100% that moving to France was what we wanted for ourselves and for our family, and we never really put much thought into what would happen if our house didn’t sell. We still are very fortunate in that we were able to spend two months vacationing in France this summer. It’s a good thing neither of us quit our jobs, that we went ahead and enrolled the kids in school “just in case”, and that we booked round-trip flights. Our flight back home was scheduled for August 6, and until the end of July we were still holding out for something to happen with the house so that we could stay in France as planned. August 6th has since come and gone, and here we are back in St. Louis working and living our lives as usual. St. Louis happens to be a wonderful place to live and raise a family, but we are still hopeful about our move to France. We’re just putting things off for one year (hopefully). The house is still on the market, and we even have a contract. Closing date is supposed to be on October 19, but we have learned not to get our hopes up too high. If everything works out with the sale of the house, we will move into an apartment for the remainder of the school year and make the move to the South of France next summer. Contract #4, Let’s do this already! My last post started out, “Moving to France in 24 days, and long-stay visa”. That was on May 14, and two contracts ago. The funny thing is that there are a lot of people interested in our house, but for reasons way out of our control (nothing to do with us or our home), the sale just keeps falling through for one reason or another. We are now (or most likely will be tomorrow) on contract #4. I think it’s a good sign that the people who want to buy our house are French. They need a car too, so we’re going to throw in the Beetle for good measure (I needed to sell it anyway). Everyone who has been crossing fingers and toes for me, please don’t stop now! This is it; I can feel that this is going to happen now. In seven days I’ll be leaving on a trip to Europe with my students. I’m leaving François at home with the kids, and he still has to work until June 15. It wouldn’t be very nice of me to leave him with two kids to care for and a whole house to pack, so that’s what I’m going to start working on tomorrow. I guess we will go ahead and reserve the container, get everything ready to load into it, and if it doesn’t work out…. Well if it doesn’t work out then I just have no idea what to think about what the next step should be. 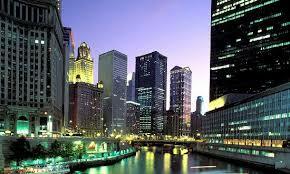 I did get to Chicago last week for my long-stay visa. I was so nervous leaving my passport at the French consulate, knowing that I need it for my trip next week. They pretty much assured me that I’d have it back in time. I sure hope so! Say what you like about French bureaucracy, but I had a great experience once I actually found someone willing to answer my emails. In the course of one day, about ten emails were sent between us. She helped me locate the documents I needed and assured me that when I came to my meeting in Chicago everything would be fine. Guess what? My meeting was scheduled for 10:20. They called my name at 10:10 because I got there a bit early. By 10:14, we’d completely finished and I was out the door. Now I have to psyche myself into believing that we’re really moving, and that this time next week I’ll be on a flight to France with my students, and I won’t be coming back (not to live here, anyway). 1. Reserve 20-foot container for a date in late June. 2. Pack up everything François and the kids won’t need over the next few weeks and get it ready to ship. 3. Empty my classroom and desk at work. 4. Put finishing details on student tour of Europe. 6. Organize a big, huge play date in the park with kids and their friends who they may never see again… That’s going to be rough. BBQ maybe? 7. Quit my job…. No, I’d better wait till after closing to do that one. 8. Get banking in order….401K thing may need to get done after we’ve moved. 9. Purchase one-way flights for François and the kids…. at the last minute just to be sure. 10. Stay calm, cool and collected (this may be the hardest part). Combien de voyageurs sont passés par là? American French teacher, living in France, living the dream. Unauthorized use and/or duplication of this material without express and written permission from this blog’s author and/or owner is strictly prohibited. Excerpts and links may be used, provided that full and clear credit is given to Jennifer Crespin and Living in Languedoc with appropriate and specific direction to the original content. Interested in reading more? Check out my recent posts. La Galette des Rois. How cute is that? What’s it like for English speaking children to go to French school?